One can consider the myriad musical differences between heavy metal and rock n’ roll. But, heavy metal stands apart from all genres when it comes to album artwork. Without hearing a single note, you can identify a heavy metal album from the artwork alone. Often this art is extreme in various ways, but can also be subtle, thought provoking, and stand alone as a work of art regardless of the music. It’s hard to say that about other genres, especially for current artists who default to generic photos of the band that lack substance and mostly follow vapid marketing trends. Further, heavy metal album covers often have a profound impact on the listeners interpretation or experience of the music. Author Ramon Oscuro Martos is devoted to celebrating the art of heavy metal album covers and delving into the stories about their creation. 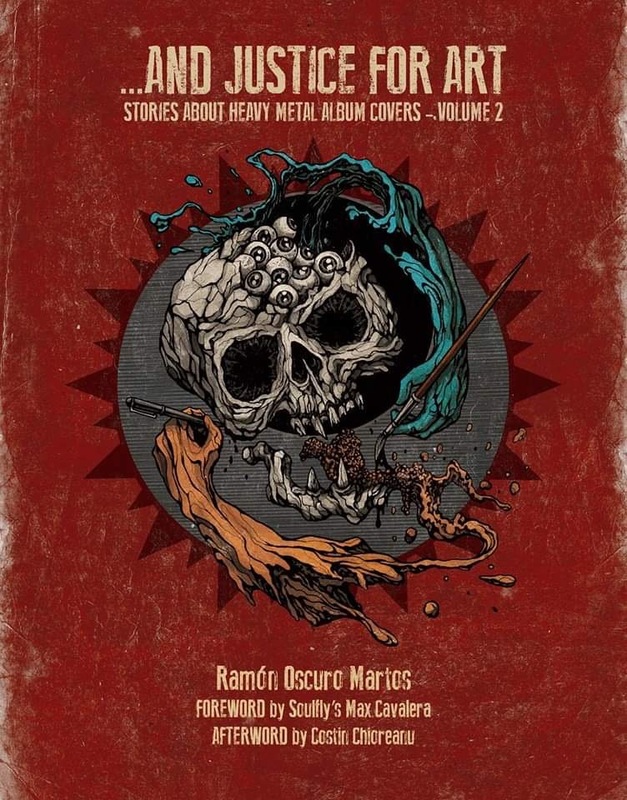 In 2015 he released the first volume of his …And Justice For Art: Stories About Heavy Metal Album Covers and has just released the second volume. With more than 252 color pages, 400-plus images, and over 100 interviews, the second volume is stuffed with cover art from albums dating back decades to just a few years ago. This approach shows how some themes and archetypes have persisted, how technology has impacted the art, and how some bands and artists have attempted to stand apart from the more stereotypical aspects of the genres themes. With both volumes currently sitting on my coffee table, I can enthusiastically recommend them to not just metalheads, but artists and photographers who want to learn more about how these album covers are created. As you will learn in the interview below (or go back to our 2015 interview with the author), even album covers you’ve dismissed in the past have intriguing stories that provoke a new appreciation. Order your copy of …And Justice For Art: Stories About Heavy Metal Album Covers – Volume 2 here. With this second volume on heavy metal album art, you’ve now covered 120 album covers. Can you see yourself doing another volume? As I see it, it’s been more than 120 covers because every chapter of each book (although focused on a specific cover artwork) also explores other images/covers. As I see it, I have explored a few hundred images…the third And Justice For Art book is already in the making and almost half-finished. But, before continuing the work on that book, I need to see what’s the public’s response towards the new Volume 2. So far, the overall reactions have been great. How have you gone about choosing which covers to include? I’m sure some are your personal favorites, but what’s your criteria for choosing which albums to cover? Like in the first book, the idea behind this second volume was to present a broad visual/musical landscape within the realm of Heavy Metal. I chose artworks from the early days of Metal (like for example, Judas Priest’s Sad Wings Of Destiny) up to the year 2018. I just wanted to create a well-balanced chronological journey that included visuals from most of Metal’s sub-genres and aesthetics. Of course, I chose a few personal favorites, but it was more important that the selected artworks were different from each other. That provides visual and conceptual variety. For example, the reader will notice a notable difference between artworks like Death’s The Sound Of Perseverance, Type Of Negative’s Bloody Kisses, and Judas Priest’s Screaming For Vengeance, among many others. So, variety was the key. You talked to so many artists and photographers about their process and creation of heavy metal album art, have any patterns or revelations emerged that might be surprising? Or is there a common element among them all? The most common pattern is that many visual artists and bands don’t like to talk too much about their imagery, unless you push them. Many people prefer to let fans create their own opinions about the imagery. That’s okay. But, I also believe that part of the artist’s duty is to be able to talk about their art if asked about it. Since my mission is to get all the information I can get, I do my best to make that happen. Of course, there are exceptions. There are people that really enjoy the process of revealing every aspect of their art. Some themes may be kind of obvious in the metal world, like blood, fire, inverted crosses, various horror and fantasy elements, but are heavy metal album covers really as stereotypical as they seem? Some of them are. Some aren’t. There is plenty of Metal-related imagery that is very tongue-in-cheek and in-your-face. But, there are a lot of images that try to convey a specific message and deeper meanings through the use of what you would call ‘stereotypical’ visual elements. The new book contains a few examples about this, like the cover of Meshuggah’s obZen. There are lots of blood, nakedness, and broodiness in that artwork. However, these elements are used to express how humanity sometimes finds balance through violence, bloodshed, etc. That’s a sad, profound message, even if portrayed in such an extreme graphic fashion. Last year you started a blog, “Sad But True: Plagiarism in Heavy Metal Art,” that has unfortunately exposed rampant theft in the metal art world. Conservatively, I chalk this up to a lot of laziness and a dearth of real talent. But, considering my question above, do you think that some of the stereotypical aspects of heavy metal artwork make the medium something that anyone thinks they can pull off with little effort? Or is the issue more deeply rooted and troubling? The Sad But True blog wasn’t my idea. It’s the brainchild of a very talented artist whose name I won’t mention here, because I believe he prefers to stay anonymous. I don’t have anything to do with that, although I support it. In visual arts, there’s a fine line between what you could call homage, cultural appropriation, and in-your-face rip-off. There’s nothing wrong with taking an existing image as inspiration for an homage, a re-imagining, or a total new artwork. But, when artists just copy-paste elements of other images and present them as originals, that’s unethical, lazy and unprofessional. There are examples of this in the new book. For example, in the chapter dedicated to the cover of Slayer’s Hell Awaits, the artist explains that he directly took some elements from an existing image because he was inexperience and also because he wanted to do an homage. So, at least he openly admitted his intentions. But sadly, that’s not always the case. Many people that do this think they have the right to do it or that nobody will notice. When we last talked about the first volume, I remember asking you something along the lines of “Why in the world did you include Metallica’s Load album?! ?” Your explanation and the feature in the book really brought to light its merits. So, now I ask: Why in the world did you include Metallica’s “Black” album? It just seems so basic and not really that inspired. What am I missing? I included this cover because the obvious choice would had been not to include it. Artworks like the one for the Black Album are a great motivation for me because they give me the opportunity to show people that there’s more than meets the eye with Metal art (and visual arts in general). Many people dismiss this cover because it is pure black with a couple of almost indistinguishable elements. Apparently, there’s not much to it. But, the artwork has a meaning and valid graphic merit. It celebrates Metal, Metallica’s American heritage, and also reinterprets the stark aesthetic of the works of artists like Mark Rothko or Barnett Newman. Besides that, the making of that artwork proved to be quite difficult and it was challenging to reproduce it correctly. In my opinion, this chapter is one of the book’s highlights! Over the last few years, heavy metal album art – specifically t-shirts – have become more prevalent in pop culture with celebrities way outside the heavy metal world wearing them. Is this hipster irony? Or do you think there’s a particular quality in the art that has become appealing to a wider audience? I believe this is one of the many distasteful trends that have emerged from the vacuous ‘hipster’ culture. Probably, there’s a team of marketers and designers trapped in a Hollywood office coming up with all kinds of outlandish ideas. They throw them in the market and see what sticks, at least for a little while. I doubt that most of the artists wearing/selling merchandise with these ‘rip-off’ logos/images have any clue about the original graphics or artists. They are just feeding from whatever the marketing machine behind them has to offer. That’s the sad reality. That said, such absurd appropriation showcases an undeniable fact: Metal imagery can be truly powerful and iconic. That’s why some feel tempted to replicate it, even in the wrong cultural context. Heavy metal is also unique in that several bands have mascots (Iron Maiden’s Eddie, Megadeth’s Vic Rattlehead, Motorhead’s Snaggletooth) or stylized fonts particular to their identity. You really don’t see this type of branding, if you will, in other genres (aside from punk). Why do you think this is so persistent in metal versus other genres? Metal has developed (visually, aesthetically, and conceptually) broader and deeper than many other music genres out there. Also, audiences’ relationship with genres like Pop, Rap, Ballad, etc. is usually more ephemerous – which is the opposite that happens with the Metal crowd. In all those genres, the imagery is usually determined by the trends of the moment, to appeal as many people as possible. Metal tends to be more independent, timeless and more honest in its visual presentation. I think that creates a stronger impact in audiences and the human psyche in general. Books like And Justice For Art – Volume 2 exist to celebrate that.